Help me put the people of Neenah and Winnebago County first. Stay up-to-date on issues and meet-ups. I will also send out a reminder to vote. Help me get the word out about my campaign. Let’s get out the vote. I grew up believing that there are no limits to what a person can achieve with effort and persistence. This philosophy has helped me overcome challenges. Life has also taught me that not everyone is given the same opportunities. I am running for office because I am ready to use my resilience to fight for you. Through this campaign, I hope to show that energy, compassion, and a fresh perspective can change the status quo. The Winnebago County Board is in need of more diversity, inclusiveness, and action. I can bring those things to the board. This race is one of the only contested seats for county board supervisor. I am listening to you, my potential future constituents, to find out what is important to you. I pledge to fight for your interests if chosen to represent our district. With your support, we can create a brighter future for Neenah and Winnebago County. Stephanie Spellman is a brilliant woman I got to know during our Emerge training. She is a fine-tuned leader, dedicated to improving everyone’s lives. Definitely a candidate worth a second look, a donation, and your vote in Winnebago County. 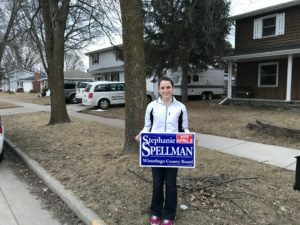 I am so excited to support the candidacy of Stephanie Spellman for Winnebago County Board. Currently only 6 of 36 board seats are filled by women. She will be a breath of fresh air in Winnebago County leadership. Please give her your vote this spring!